Editor's note: This article was updated on January 8th, 2019. Dexcom and Verily are launching the G7, a much thinner, less expensive, fully disposable continuous glucose monitor (CGM), in the US in about two years – late 2020 is the current estimate for the launch, followed by broader availability in 2021. In a recent presentation, Dexcom shared a new picture of the device previously coined the “thinnest CGM ever” that it is developing in partnership with Verily (the part of Alphabet formerly known as Google Life Sciences). Significantly lower cost, which should help bring CGM to more people with type 2 diabetes. Fully disposable – after a sensor wear, the entire piece of plastic will be throw out and a new one will be placed on (like FreeStyle Libre). G6 currently has a reusable transmitter that lasts 90 days and adds cost to the system. No fingersticks necessary, similar to G6. “Extended wear” – 14- to 15-day wear, up from the G6’s current 10 days. Sends data straight to smartphones via Bluetooth, similar to G6. It’s also possible Dexcom will get rid of the current requirement to purchase a receiver – further reducing cost. This sensor will be made widely available to people with diabetes who are on intensive insulin therapy (pumps or multiple daily injections) and those with type 2 diabetes on pills or no medication. Moving forward, Dexcom plans to offer the same hardware for different groups of its customers, differentiating the sensor via software/apps. What else is in Dexcom’s pipeline? “Pro Q” Professional G6 CGM. This fully-disposable, clinic-owned CGM is expected to roll out in the US in 2019 if all goes as planned. Similar to Abbott’s FreeStyle Libre Pro professional CGM, healthcare providers and clinics will own these devices and place them on users during office visits. Product details on “Pro Q” have not been shared, and we’re not sure if users will be able to see their glucose levels or not. In the case of Abbott’s FreeStyle Libre Pro device, the user cannot see his/her glucose data while wearing the device; the data is downloaded by the provider after 14 days for review in a follow-up clinic visit. This “Professional” approach to CGM gives providers and people with diabetes visibility into their glucose trends over a short span of time without requiring a long-term commitment to CGM, allowing them to learn about the impact of certain behaviors and medications on their glucose levels. “G6 Glucose Program” (only for Samsung J3 phones so far). This app is intended for people who are not at risk for severe hypoglycemia, offering a different version of the currently available G6 app. The G6 Glucose Program will offer in-app chat with a wellness coach and removes the high or low glucose alerts. Dexcom has not said when it will launch, though more pilots of CGM in type 2 diabetes are expected in 2019 if all goes well. Insulin dosing advice for users on injections. 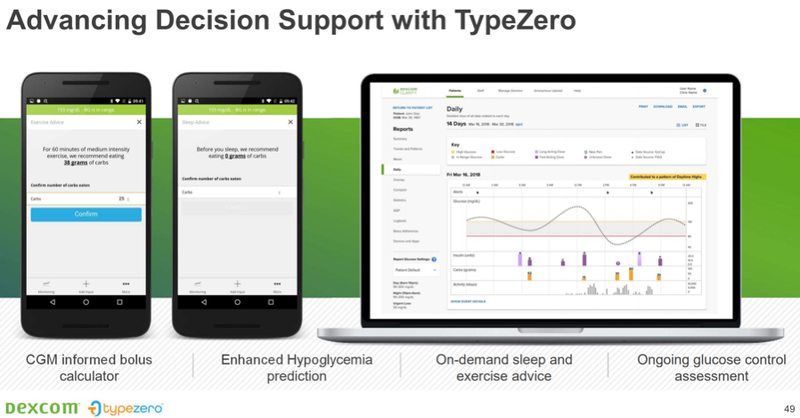 Dexcom recently acquired TypeZero, a software startup that has insulin dosing advice algorithms for injection users. During the presentation, a slide of a CGM-based mealtime (bolus) calculator, forward-looking hypoglycemia prediction, and even sleep and exercise advice were shown – e.g., “For 60 minutes of medium intensity exercise, we recommend eating 38 grams of carbs” or “Before you sleep, we recommend eating 9 grams of carbs.” These features could make dosing insulin far easier for those on injections, removing guesswork and math. TypeZero’s Control-IQ algorithm for automated insulin pump delivery is currently in its pivotal study using the Tandem t:slim X2 device; a launch is currently expected in summer 2019.